Just when I thought I was all grown-up and had accepted that Valentine’s Day is a mass-market scam, I fell into the huge boggy bit of my heart that I thought had near-dried up with the desiccation of age. Like when Dawn French falls into that unfeasibly deep puddle in the Vicar of Dibley – there I was just ambling along in my terribly modern cynicism when SLOSH – waist-deep in forgotten goo. 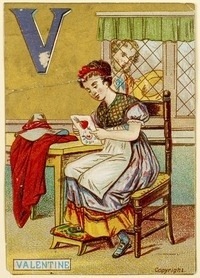 It’s become terribly unfashionable to like Valentine’s Day. Confessing to enjoying the Hallmark hullabaloo, or even its older quainter conventions, is almost becoming un-PC – like saying you’d like to abolish disabled parking bays, or go on your summer hols to Tanzania and shoot the last of the black rhinos in the face. I thought I was a fully paid-up member of the Puke Patrol. I thought I could stay steely before a proffered rose. I thought I was one of the great denouncers of accepted Romance; could snort derisively at Keats if quoted on the fourteenth day of the second month. That I was way above making doe-eyes over an overpriced meal in a restaurant flatulating at the seams with helium balloons; that I’d knee a man in the nuts if he waved anything bought at Clintons anywhere near me. I should have suspected I wasn’t quite up to the current vogue of Non-Schmaltz standards when watching Sleepless In Seattle recently. The Empire State building flooded with red hearts just as dear Meg was sweetly dumping her fiancé for Tom Hanks AND I OUTWARDLY SNORTED THE CONTENTS OF MY CRANIUM SO HARD I STILL HAVEN’T FOUND WHERE IT ALL WENT. I think I might have blown open another portal to Narnia. Some poor fawn is probably wandering around with my snot as a jaunty hat. I’ll tell you. Someone I know told me it was their first Valentine’s day, with an actual Valentine, with a lover. I didn’t believe them. They are in their thirties, and cute as a button. But they were telling the truth, and for them it wasn’t a silly day. Granted, they didn’t want to run down the street slathered in chocolate body paint, rattling handcuffs that chimed the theme to Zeffirelli’s Romeo & Juliet, but they wanted to mark it. They wanted their Valentine’s Day. It reminded me of what Valentine’s Day used to mean to me, before I’d had a few extraordinarily bad boyfriends and a divorce under my belt. Making cards for hours, doodling boys names in biro hearts on my arm like love-charm tattoos, my first real card from a boy that wasn’t just my Dad doing bad handwriting, my first Valentine’s kiss, hotels, restaurants, post bunk-up bed-bouffants… Et sexera. I wondered if the true magic of Valentine’s Day doesn’t lie in the day itself, but in the future that it paints. There’s mystery in all that love stuff. You’re not just excited about the date you’re on, but the dates that will come. What does love have in store for you? What is your future? Love – the confusing dance around the simple biological urge to procreate – is about what will come, as it were, and what will come after that. Love is how we ensure that our silly messy little race will continue. Love is our survival. Shouldn’t at least one day in 365 be a little bit about that? Love should not of course be vouched by homogenised overpriced tat. Of course I know the best stuff is free – poems on a napkin, holding hands in the rain. A ruddy good snog-up in a doorway. But surely the people who have been lucky enough to have all this typical Valentine ‘stuff’, cards and flowers and chocolates and stupidly huge teddies delivered to work, don’t really have the right to denigrate it? If you’ve had it all and don’t want it anymore out of some consumerist stand, then don’t have it, but stop telling people that’s what you’ve decided, every fricking year. Grumpy repetition merely creates an alternative-tradition, a parallel non-celebration, a contra-dedication of your time and energy, and certainly one with a less uplifting message at its heart. If you don’t believe in something – the hype of Valentine’s Day, the existence of God, whatever – you have already asserted something strongly enough to yourself. Humans should be content with knowing or supposing what they think they know or suppose, and live their own lives accordingly as they wish. They don’t need to make big outward proclamations; they’re pretty pointless outside of the environs of an invited debate. Having a non-belief in something is not something to be proud of, is not something which defines you as interesting or intelligent; it is just a fact about yourself, like having blue eyes or an outie belly-button. In decrying something essentially harmless we have nothing to offer but a bad energy and there’s enough of that floating about.